^ africaninspace.com. 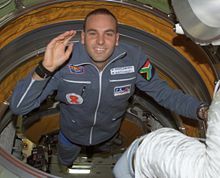 First African in Space. HBD. 2002 [October 4, 2007] （英語）. ^ Space.com, Nelson Mandela與Shuttleworth的通話 網際網路檔案館的存檔，存檔日期2005-04-06., 2002-05-02. ^ Space.com, Nelson Mandela Chats with Shuttleworth 網際網路檔案館的存檔，存檔日期2005-04-06., 2002-05-02. ^ BBC News, 太空人，不是「新郎哥」, 2002-05-28. ^ Dispatch online, 馬克的最忠實粉絲因癌症逝世 網際網路檔案館的存檔，存檔日期2005-08-29., 2002-05-28. ^ Mark Shuttleworth Becomes the First Patron of KDE. KDE. 15 October 2006 [2006-10-16].